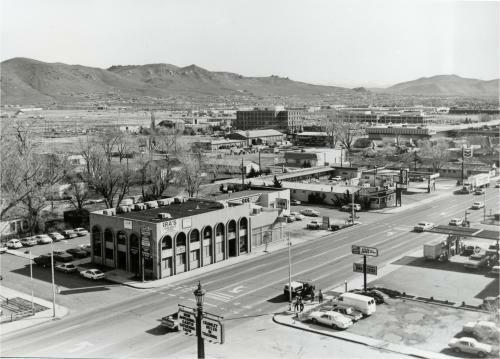 This panorama of southeast Carson City was taken in the winter of 1986 from a room in the Ormsby House hotel tower. There's a lot to see here. Starting at the very bottom you can see the marquee advertising upcoming gigs at the Ormsby House; the Garfin Gathering is now appearing, and Cramley Huler is in training. In the lower right corner the Arco gas station is visible. Prices are 94 cents for "regular", and $1.03 for unleaded. The prominent building in the foreground is the DiLonardo Building, home to several businesses: Swensen's Ice Cream Factory, the Hair Loft, IDS, and a travel agency. Sierra Land Realty and Tripe S Tries are next door. Further down the street, across Eighth Street, is the Sierra Sage Motel, and the Chevron gas station. Past Ninth Street is the Pioneer Motel, and beyond that you can barely see the spire of the A&W Restaurant at Tenth Street. In the distance behind the motels, you can see the end of the Carson Mall and the JC Penney. And further still is the DMV building, then the Mallory Way industrial neighborhood. And behind that Carson City's residential areas stretch all the way to the bottom reaches of the hills. The dark building at the top center of the photo is the NDOT headquarters on Stewart Street, and right below that is the Copeland Lumberyard across the street. In the trees just this side of Copeland is the old Plaza Motel on Plaza Street, which was torn down and rebuilt in 1995. In the upper left of the photo is a lot of open space that has since been taken up with houses.